Eyck, Jan van (b. before 1395, Maaseik, Bishopric of Liège, Holy Roman Empire [now in Belgium]--d. before July 9, 1441, Bruges), Flemish painter who perfected the newly developed technique of oil painting. His naturalistic panel paintings, mostly portraits and religious subjects, made extensive use of disguised religious symbols. 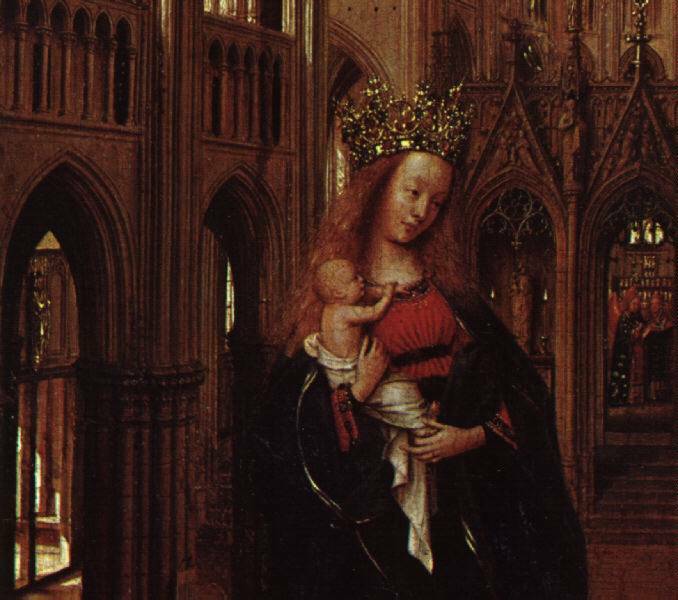 His masterpiece is the altarpiece in the cathedral at Ghent, the Adoration of the Lamb (1432). Hubert van Eyck is thought by some to have been Jan's brother. No record of his birthdate survives, but it is believed to have been about 1390; his career, however, is well documented. He was employed (1422-24) at the court of John of Bavaria, count of Holland, at The Hague, and in 1425 he was made court painter and valet de chambre to Duke Philip the Good of Burgundy. He became a close member of the duke's court and undertook several secret missions for him, including a trip (1428-29) to Spain and Portugal in connection with negotiations that resulted in the marriage (1430) of Philip of Burgundy and Isabella of Portugal. Documents show that in 1432-33 van Eyck bought a house in Bruges. He signed and dated a number of paintings between 1432 and 1439, all of which are painted in oil and varnished. According to documents, he was buried on July 9, 1441. 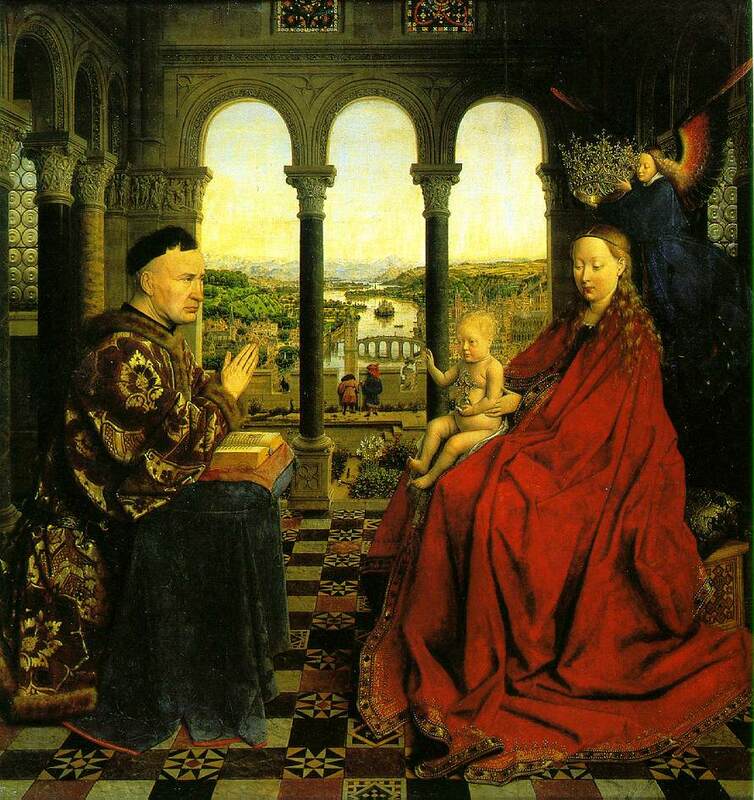 Van Eyck has been credited traditionally with the invention of painting in oils, and, although this is incorrect, there is no doubt that he perfected the technique. He used the oil medium to represent a variety of subjects with striking realism in microscopic detail; for example, he infused painted jewels and precious metals with a glowing inner light by means of subtle glazes over the highlights. Like Robert Campin, van Eyck carefully selected and arranged his subject matter so that it would contribute deeper symbolic meaning to his painting, a style that Erwin Panofsky has called disguised symbolism. The meticulous attention to detail in his paintings of architectural interiors and landscapes is also evident in his portraits, painted with unrelenting, dispassionate accuracy. Van Eyck's most famous and most controversial work is one of his first, the Ghent altarpiece (1432), a polyptych consisting of twenty panels in the Church of St. Bavo, Ghent. On the frame is an incomplete inscription in Latin that identifies the artists of the work as Hubert and Jan van Eyck. The usual interpretation is that Hubert van Eyck (d. Sept. 18, 1426) was the brother of Jan and that he was the painter who began the altarpiece, which Jan then completed. Another interpretation is that Hubert was neither Jan's brother nor a painter, but a sculptor who carved an elaborate frame for the altar. Because of this controversy, attribution of the panels, which vary somewhat in scale and even in style, has differed, according to the arguments of scholars who have studied the problem. The exterior of the altar depicts Jodocus Vijdt, the donor, and his wife kneeling on either side of two grisaille (painted in gray to resemble statuary) representations of St. John the Baptist and St. John the Evangelist; above is an Annunciation. The brightly colored interior is dominated by a panel representing the Adoration of the Holy Lamb . Equally famous is the wedding portrait of Giovanni Arnolfini and his wife (1434; National Gallery, London), which the artist signed "Johannes de Eyck fuit hic 1434" (Jan van Eyck was here), testimony that he witnessed the ceremony. Other important paintings are the Madonna of Chancellor Rolin (1433-34 Louvre, Paris) and the Madonna of Canon van der Paele (1436; Groeninge Museum, Bruges). As we look at the Annunciation , we become warmly conscious of the gentle radiance of the light, illuminating everything it embraces, from the dim upper roofing to the glancing gleam of the angel's jewels. The clarity would be too intense were it not also soft, an integrating, enveloping presence. This diffused presence, impartial in its luminescence, is also a spiritual light, surrogate of God Himself, who loves all that He has made. The symbolism goes even deeper: the upper church is dark, and the solitary window depicts God the Father. Below though, wholly translucent, are three bright windows that remind us of the Trinity, and of how Christ is the light of the world. This holy light comes in all directions, most obviously streaming down towards the Virgin as the Holy Spirit comes to overshadow her: from this sacred shadow will arise divine brightness. Her robes swell out as if in anticipation, and she answers the angelic salutation `` Ave Gratia Plena '' (``Hail, full of grace'') with a humble `` Ecce Ancilla Domini '' (``Behold the handmaid of the Lord''). But with charming literalness, van Eyck writes her words reversed and inverted, so that the Holy Spirit can read them. The angel is all joy, all smiles, all brightness: the Virgin is pensive, amazed, unbejewelled. She knows, as the angel apparently does not, what will be the cost of her surrender to God. Her heart will be pierced with grief when her Child is crucified, and we notice that she holds up her hands in the symbolic gesture of devotion, but also as if in unconscious anticipation of a piercing. The angel advances over the tiles of a church, where we can make out David slaying Goliath. (Goliath represents the power--ultimately fruitless--of the Devil.) The message the angel gives Mary sets her forth on her own road to the giant-slaying that is her motherhood and holiness. The van Eycks started their careers as manuscript illuminators. The often miniature detail and exquisite rendering found in van Eyck paintingsm such as the Annunciation , reveal a strong affinity with this art form. However, the single factor that most distinguishes the van Eycks from the art of manuscript illumination was the medium they used. For many years Jan van Eyck was wrongly credited with the ``discovery of painting in oil''. In fact, oil painting was already in existence, used to paint sculptures and to glaze over tempera paintings. The van Eycks' real achievement was the development--after much experimentation--of a stable varnish that would dry at a consistent rate. This was created with linseed and nut oils, and mixed with resins. The breakthrough came when Jan or Hubert mixed the oil into the actual paints they were using, instead of the egg medium that constituted tempera paint. The result was brilliance, translucence, and intensity of color as the pigment was suspended in a layer of oil that also trapped light. The flat, dull surface of tempera was transformed into a jewel-like medium, at once perfectly suited to the representation of precious metals and gems and, more significantly, to the vivid, convincing depiction of natural light. Van Eyck's inspired observations of light and its effects, executed with technical virtuosity through this new, transparent medium, enabled him to create a brilliant and lucid kind of reality. The invention of this technique transformed the appearance of painting. `` The Arnolfini Marriage '' is a name that has been given to this untitled double portrait by Jan van Eyck, now in the National Gallery, London. It is one of the greatest celebrations of human mutuality. Like Rembrandt's `` Jewish Bride '', this painting reveals to us the inner meaning of a true marriage. The bed, the single burning candle, the solemn moment of joining as the young groom is about to place his raised hand in his betrothed's, the fruit, the faithful little dog, the rosary, the unshod feet (since this is the ground of a holy union), and even the respectful space between Giovanni Arnolfini and his wife, Giovanna Cenami, are all united in the mirror's reflection. All these details exalt us and at the same time make us aware of the human potential for goodness and fulfilment.